An amazing memorable Christmas holiday! Our family of nine, from age 59 to 6 months stayed at Villa Surrender for one week. We were looking for a location that the family could spend a week together in the Caribbean in a location that provided plenty of room for living inside and out, and was in an area that we could do some touring and exploring. We found it! Villa Surrender is beautiful. We loved the arrangement of living space and the way the outdoors comes inside. The kitchen was large enough several people to coordinate meal preparation, and exceptionally well equipped. Happy hour was a delight with gorgeous sunsets and we ate outside every night. We enjoyed the proximity to Christoffel for hiking and Sheta Boka for walking. We also appreciated the fact that the villa is on the grounds of Kura Hulanda Lodge and so we were able to use their beach and enjoy their bar and restaurant. Knowing that Heinrich (concierge) was a phone call away was helpful too. We would highly recommend Villa Surrender. Our family recently returned from a wonderful stay at Surrender. The property, house and view are amazing; the pictures honestly aren’t able to do them justice. The house is located at the end of the Kura Hulanda Lodge Property, with access through a manned, gated entrance which provides a nice added sense of security and privacy. The house itself is beautifully built with high-end finishes throughout. Together with the fully stocked kitchen (complete with a built-in Nepresso machine), general supplies provided, infinity pool, stairs down the cliff to the ocean, and one of the most amazing, serene views, you may not want to leave the property. However, do try to pull yourself away as there are many unique beaches and activities in the area. Some of our favorite beaches included Little Knip, Playa Lagun (beautiful sunsets! ), and Boka Santu Pretu. Also, if you are up for a bit of a hike and more amazing views, Mt Cristoffel was a pleasant surprise (while a bit difficult, even our 6 year old made it to the top with some help). If you like a relaxed, less touristy area to explore and discover, this side of Curacao is an excellent choice. You won’t find a more perfect place to call home while you’re there (just make sure you pick up some groceries and gas on your way out of town toward the West End). My husband and I were looking for a special place to honeymoon. We were extremely pleased to arrive and see the property is more beautiful than any picture can capture. Surrender Villa is a spectacular home! An easy drive from the airport. About a thirty minute drive across beautiful Curaçao. We were met by the grounds keeper who thoughtfully put flowers all over the house and filled a welcome basket with scrumptious local goodies and champaign. The villa is designed perfectly... Big beautiful rooms, tastefully and beautifully decorated so all rooms have a view, most of the ocean. The living area opens widely to a magnificent private covered veranda, infinity pool overlooking the western view of the beautiful blue ocean. The sunsets were amazing. We explored local beaches and restaurants, went snorkeling at Go West Dive.. And took a sunset cruise that passed right by the villa. The Perfect Relaxing Honeymoon Location! Where do I even begin? The stunning ocean/bluff/sunset view? The spacious and luxurious house? The best property manager/concierge (Hynrich) on the island? What a stay! We wanted to rent a house for our honeymoon that would allow us a sun-drenched and relaxing week. With the infinity pool, great snorkeling right off the bluff stairs, the fantastic weather - with near perfect sun and constant ocean breezes, and every amenity we could have wanted in the house....we barely left the property! Hynrich contacted us before the trip and we arranged to have our list of groceries bought and delivered for our arrival. This was the best decision as we used the gourmet kitchen and wonderful gas grill to cook almost all our meals when we were there. The two dinners we ventured away from the house were at Kura Hulanda Lodge's restaurant on property - quite tasty! And then Sol Food (only open Friday-Sunday) - amazing pizza! 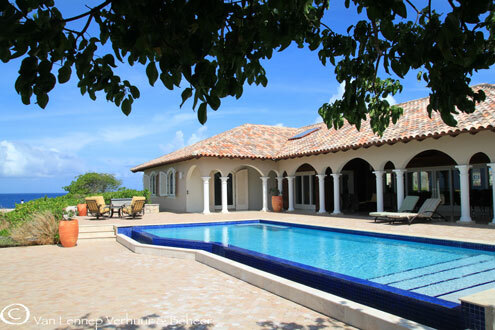 The house sits in a pseudo "neighborhood" at the back of the Kura Hulanda Lodge, but is essentially on the northwest tip of Curacao. This means that you get the best breezes on the island and most certainly the best sunsets right off the point. I'll post some of our pictures. Hynrich was fantastic during our stay and was constantly checking on us to make sure we were OK and had everything we needed. He also arranged for massages at the house with the BEST massage therapist I've ever had! As a former athlete who has had my fair share of massages (both therapeutic and relaxing) - this one was unreal. Our one main adventure from the house was hiking/climbing Mt. Cristoffel Mountain in Cristoffelpark. This was quite the experience! First off, getting to the beginning of the hike itself was quite a journey as the road through the park is quite the sight and goes up and down and twisty turny. Make sure you have your best driver behind the wheel - it's awesome! Secondly, the hike was definitely on the more advanced/strenuous side of hiking. The last 20 minutes is basically pulling yourself up rough rock formations and tree roots. Definitely worth the view though! Our honeymoon was absolutely perfect and we'd be happy to answer any questions candidly. We can't wait to plan our return visit to Surrender Villa! Great place to stay, very private, beautiful furnishings, loved it all. Beach is just down the road, 5 minute drive. An amazing villa in a gorgeous location! - Design: This is one of the best designed villas we've been to for two couples traveling together. It has a great layout, lots of outdoor space (both sunny and shaded) and is beautifully decorated. - Amenities: A beautiful pool looking over the ocean, great furniture, a well-equipped kitchen with new appliances and kitchenware, a good washer and dryer (great for allowing for light packing). Everything in the villa was in working condition and well maintained. - Hosts: From the outset, Charlotte was in touch with us. They arranged for pre-stocking the kitchen for us (great since we arrived late at night). We were met at the airport and guided to the villa (good, since it's 30 mins from Hato). And the owners and their reps were in touch (via email and phone) throughout our stay to ensure everything was okay. So, as you can hopefully tell, we LOVED our stay here and would definitely return. Our thanks to Janet and Charlotte for taking such good care of us. Surrender is truly a little piece of paradise! We had a group of about 6 girls and it was perfectly accommodating. With such a large group, we utilized the kitchen almost every day. Everything was modern and clean, the best part was the built in Nespresso machine. My mornings consisted of drinking coffee, sitting on the patio, looking out at a completely unobstructed view of the ocean. Between the cliff diving and local restaurants, there was plenty to see and do but some of my favorite memories were at the house itself, cooking out on the grill, looking out at what seemed to be an endless ocean. The property is beautifully maintained, with gorgeous landscaping and an amazing backyard. The infinity pool and surrounding patio is tranquil and relaxing, again with amazing views of the ocean everywhere you look! If you're looking for a 5 star escape from the every day hustle & bustle, this is the place. Thank you for such a wonderful experience, I will be coming back soon! It wouldn't matter what CDs I select to take to a desert island, as long as I was staying in Surrender! Wow! My stay at Surrender Villa marked my first time visiting Curaçao. Usually when I travel, I am quite antsy. I want to explore the entire area; bike, hike, sample the local restaurants, etc. At Surrender Villa, I never wanted to leave the property. My mornings began by joyously preparing breakfasts in the spacious, inviting kitchen, while graced by the soothing trade winds. Whether dining inside or outside, the views were mesmerizing. Words cannot adequately describe the exhilaration I experienced when diving off the ten foot cliff, and jumping from the 28 foot cliff (or call it 30, if you want) into the Caribbean Sea. The feeling of having the ocean to myself as I watched the property from the sea felt other-worldly. One of my favorite times was late evening, around sunset. Enjoying a final swim in the ocean, or desalinizing in the pool while the sun meditatively drifted onto the horizon, was unforgettable. The remote location on the island, away from ambient light, allowed for optimum stargazing upon nightfall. My five days at Surrender Villa felt timeless. It is aptly named, as I completely surrendered any concerns or worries that I typically carry in my day-to-day life. Additionally, I felt more spiritually and emotionally open to life and to others during this transformative vacation. Surrender Villa offers the ideal opportunity for anyone seeking a luxurious respite from civilization. The Villa sits atop a windswept cliff at the Western most point of the Island. The ocean is your vast and unencumbered backyard. Sunsets can be enjoyed from the outdoor patio, the infinity pool or the comfort of the plush couch in the central living room. During our stay, there were no bugs, no humidity, no distractions. The layout of the Villa, spread out on a single floor, encourages communal interaction while also affording privacy and solitude. The kitchen is well equipped and is complimented by a patio grilling area. With the availability of having fish caught that day delivered to the Villa, there was no reason to seek out local restaurants. It is rare to truly experience a hassle free vacation but my stay at the Villa was just that. I look forward to returning soon. Surrender Villa is a feast for the eyes and a balm for the soul! We spent a week at Surrender Villa with two other couples and there was enough space to totally relax in solitude as well as have fun all together. It is very private without being isolated. The house and grounds are in a beautiful setting on a cliff overlooking the ocean. The terrace and infinity pool look out onto the ocean, and there are magnificent views from every one of its many windows. The house is spacious (on one level) with a great layout allowing for privacy when you want it. It is clean, airy (we had no need of AC), well-appointed, elegant yet comfortable. The living room has an amazing wall of glass that opens up completely to the terrace with its pool and breathtaking view of the ocean. The home still feels new, the appliances are modern and every amenity has been provided. We felt very comfortable and taken care of. We particularly enjoyed having the choice of the pool, the ocean (down a rock staircase, reminiscent of Italy, to a ledge and ladder from which to access the water), or any one of several beaches within driving distance. There are plenty of restaurants in town with varying menus and price ranges. There are also two restaurants within walking distance although you may be hard pressed to pull yourself away from the magnificent ocean sunsets. The terrace is expansive with plenty of seating in both sun and shade and is great for just hanging out. Whether you want romantic, casual or elegant, this is the perfect ambiance for all of it.